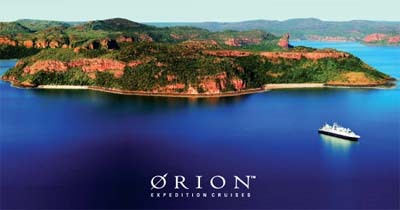 For two special departures in August and September 2011, Broome & The Kimberley Holidays are offering FREE return flights from most capital cities to join Orion on a spectacular expedition cruise of the Kimberley coast between Darwin and Broome. Few travellers are fortunate to experience the majesty of the untamed Kimberley in all its splendor, especially late in the Kimberley cruising season when most of the waterfalls have ceased to a trickle. However this year is proving to be the exception. Mr Bernard Whewell, Managing Director of specialist travel company, Broome & The Kimberley Holidays says, " a Kimberley Cruise is a holiday experience like no other. With the recent unseasonal rain in our region, passengers booking an end of season cruise are more likely to see spectacular scenery and waterfalls in flow, which is unusual at this time of year." "This year, we have worked closely with our local cruise partners to negotiate offers representing great value for our clients, to experience one of life's great adventures" he says. "We have partnered with Orion Expedition Cruises to offer our clients FREE FLIGHTS from any Australian capital city to join Orion in either Broome or Darwin. The cruise highlights include the Horizontal Waterfalls at Talbot Bay, the tidal phenomenon at Montgomery Reef, and the plunging waterfalls at King George Falls, to name a few." 10 Night cruises start from $8190* per person twin share in a Category B cabin on board Orion and includes our FREE FLIGHT offer. *Conditions apply. Available for immediate sale for travel on specific departures, 24 August 2011 ex Broome to Darwin & , 03 September 2011 ex Darwin toBroome.